Rings of Mara are special items in ESO which grant bonus experience, and are rewarded to those who have completed the Ritual of Mara. Two players can complete the ceremony, and at least one of them needs to have the Imperial Edition of Elder Scrolls Online. To get a Ring of Mara, you must first complete the Ritual of Mara. For the ritual you need at least one player who owns the Imperial Edition of ESO, as mentioned above. Every Imperial Edition player receives an item called Pledge of Mara, which is needed to initiate the ritual. Imperial Edition owners can partner up with people who own the Standard Edition of the game, though. The former shrines are located in the city you arrive in as you leave the Wailing Prison tutorial area. The latter Shrines of Mara are located right next to the skill point and attribute reset shrines, in the second major non-tutorial zones of each alliance. The shrines are also marked on the map, so you should be able to find them quite easily as long as you are in the correct city. Once both players are next to a shrine of Mara, the player with the Pledge of Mara can target the other player and then evoke the Ritual of Mara. The only way to do this is to quickslot the Pledge of Mara, and then target the other player with it. Note that the Pledge of Mara can only be used once. You can’t just ninja ritual someone either, the partner actually needs to agree to pledge commitment to you through a confirmation window. After the ritual has been performed, both players will receive a Ring of Mara, with their partner’s name carved on them. The commitment is real. You will NOT be able to break the union. The names on the Rings of Mara can NOT be changed, ever. The ritual is between two characters, not accounts. I have one character, my friend has a main and an alt. Using his Pledge of Mara, he initiated the ritual with me, while on his main character. He switched to his alt, and using my Pledge of Mara, I initiated with his alt. Each of his characters has one ring, while my character has two. I can either wear both, or switch them out depending on which character I am playing with. 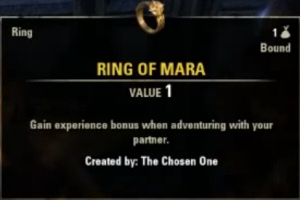 In ESO beta the Ring of Mara experience bonus boost was 10%, and the ring had no other stats on it. You need to be in the same group with your partner. You need to wear the Ring of Mara. It makes no difference where your partner is. For all Mara cares, they could be on the other side of Tamriel. The distance between you and your partner does not affect the experience boost, according to an ESO Customer Support representative. To get the most out of Rings of Mara, you want to partner up with someone who’s able to play at the same time with you. 10% Experience boost is a pretty significant bonus to experience gained, and it will certainly speed things up. If you want to reach the veteran ranks fast, using Rings of Mara is the way to go, there is no question about that. However, since the Rings of Mara have no stats on them, you are paying a price in combat performance. The other option is to use a normal ring which will help you out in combat, but provide no experience boost. Levelling quick is not necessarily just a good thing. It can mess up your experience curve and you can find yourself in situations where you are not receiving experience from quests because you outlevel the content. To benefit from the experience boost, you might have to skip some quests. As you can see, there are some trade-offs you’ll have to make if you choose to use a Ring of Mara, and whether you think it’s worth it or not is up to you in the end.